There is a long history of unequal access to services in Kenya, including core social services such as education and health. In 2010, Kenya adopted a new constitution and introduced devolution in part to address these inequalities. Devolution saw the transfer of significant health functions to county governments with the national government left to play the role of policy making and running top referral hospitals. But ensuring vulnerable and marginalized groups have accessible health care can be a challenge, necessitating deliberate interventions by government. Health workers are the largest input into health services and therefore, the distribution of these workers is a major indicator of equitable access. 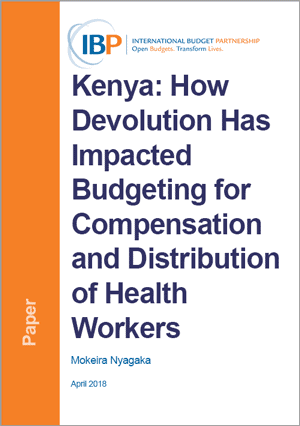 Under devolution, counties have control over their own health budgets and workforces and therefore should be able to change their spending patterns to adjust the number and distribution of health workers.